I haven’t posted much about perfume but perfume is one thing that I am insanely obsessed with. I have a weird phobia about smelling bad that I have had ever since I was in middle school. As a result, I have a perfume collection that is equivalent to a down payment on an expensive car and a candle collection that most people would consider unhealthy. Perfume is something that is completely personal to every woman and says something about a woman’s personality that cannot be conveyed in other ways. I think the way you smell speaks volumes about who you really are and is a huge part of first impressions. I have perfumes that span my life, fruity scents from middle school, fruity florals from high school, clean and fresh scents in my late teens and early twenties, and now that I’m reaching my mid-twenties I have ventured into more mature scents. But this post isn’t about my taste in perfume, its about the new perfume release from Vera Wang, a much awaited spin on the ever popular Princess. 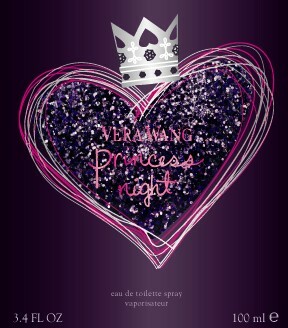 Vera Wang “Princess Night” is a new take on the popular “Princess”. When I think of Vera Wang “Princess” I think of every girl, as it” is in every girls collection, including mine in a mini version, and is universally appealing. “Princess” always seems to be on best seller lists at my Macy’s and Sephora and is the type of scent that will smell good on almost any younger woman. “Princess Night” is slightly different but still has hints of the original. 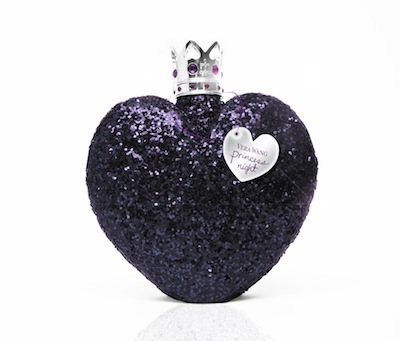 The “Princess Night” bottle is the same heart shape as the other Vera Princess perfumes but is encrusted with black and purple glitter. I have to say I love that concept, I think it looks so pretty but it may be hard to tell how much product you have left in the bottle as you continue to use it. Although I don’t have a problem with that, some women like to see the visual usage of their perfume so I thought I would put in my two cents. Also unlike the original, the crown on top is silver rather than gold. Everything else is very reminiscent of all the other Princess perfumes. This perfume is described as “Floral Exotic Woody”. Based on the notes, I think this perfume is going to be very sweet and I don’t know where the “woody” notes are to classify this perfume as “woody”, but I haven’t smelled it yet so it may be. I’m excited to smell this one because I think its going to be similar to the original but maybe a little bit more heavy. Again, I haven’t smelled it so I’m just guessing but I am really curious about this one. Release date January 11, 2012! 10 Items Every Girl Should Carry In Her Purse! ← China Glaze Hunger Games Collection!! !